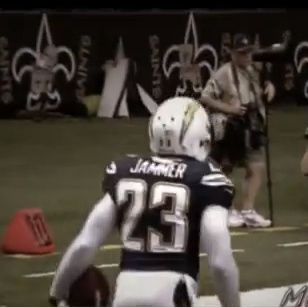 On Wednesday, the Denver Broncos announced that cornerback Quentin Jammer signed with the team. But when the team announced the signing, they dubbed Jammer a "defensive back," a sign that likely indicates the team is not planning to play him solely at cornerback. He may compete for a nickel position, and CBS4 Denver's Vic Lombardi reported that he was brought in "primarily to play safety." Jammer is entering his twelfth season at age 33, but the Broncos know from first-hand experience that he can still make big plays on defense. Jammer has started in all sixteen games in eight of his eleven seasons in the league, including last year when he recorded 64 tackles, three interceptions and a forced fumble. Since 2003, Jammer has missed just three starts, starting in the most games by an NFL cornerback during that time (157). The Denver Post has speculated that Jammer's one-year deal is close in value to the ten-year veteran minimum of $940,000. Interestingly, the 'Post also notes that Jammer's former agent, Mike Sullivan, is now in charge of Denver's salary cap and contract negotiations. Jammer's current agent is Andy Ross, who stepped in when Sullivan joined Denver last year. In twelve career games against the Broncos, Jammer went 6-6 while recording four interceptions and returning one of them for a touchdown in 2012. With running back Willis McGahee currently owning jersey No. 23, Quentin's number in San Diego, Jammer has tentatively chosen No. 34. Jammer (6'0", 204 pounds), spent the first eleven years of his career with the San Diego Chargers after being selected fifth overall in the 2002 NFL Draft. A safety at the University of Texas, the Chargers converted Jammer to cornerback when he landed in the NFL. Expected to again switch back to safety, Jammer played quarterback in high school.